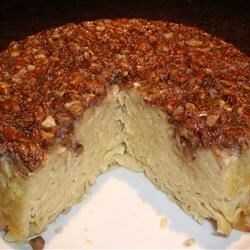 "Noodle kugel coated with a brown sugar/pecan mixture hot out of the oven is sweet enough it could also work as a dessert. This is an old family recipe guaranteed to be loved by all!" Fill a large pot with lightly salted water and bring to a rolling boil over high heat. Once the water is boiling, stir in the egg noodles, and return to a boil. Cook the pasta uncovered, stirring occasionally, until the pasta has cooked through, but is still firm to the bite, about 5 minutes. Drain well in a colander set in the sink. Preheat an oven to 325 degrees F (165 degrees C). Beat eggs in a large bowl. Beat in half of the melted butter, then stir in half of the brown sugar and a pinch of salt. Stir in the noodles, making sure the noodles are evenly coated. Spread the remaining butter on the bottom of a deep baking dish. Sprinkle the remaining brown sugar in the baking dish, patting the sugar up the sides. Spread pecans over the brown sugar. Pour noodle mixture over the sugar. Bake in the preheated oven until firm, about 1 hour and 15 minutes. Run a paring knife between the kugel and the edge of the baking dish. Hold the pan on its side and gently tap the sides of the pan against the counter to loosen it. Cover the baking dish with a large platter and invert it to tip the kugel out of the baking dish and onto the plate. This sweet, creamy egg noodle casserole is traditional Jewish comfort food. This was a BIG HIT at my table for Shabbat lunch. The pecan and brown sugar topping was soooo good, and it looked beautiful. A great side dish to put on the table when having guests. The noodle puddling was delicious. It was very sweet however. I would cut the sugar in half. The presentation was beautiful and everyone liked it.